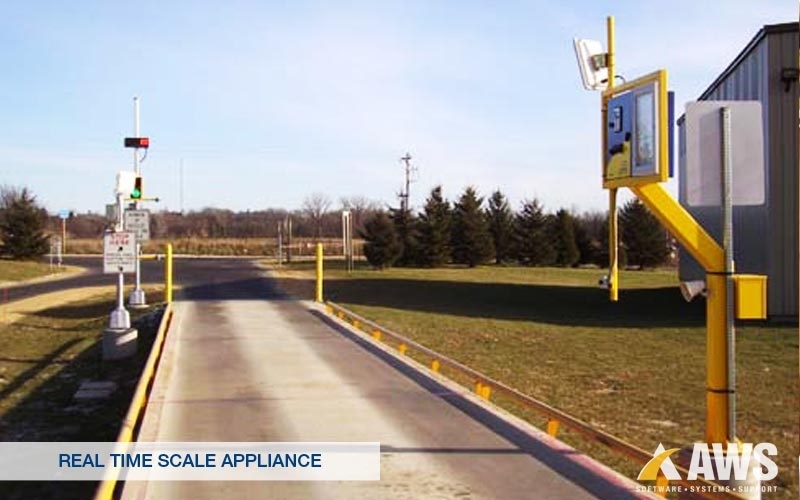 The Real-Time Scale Appliance (RTSA™) kiosk is a PC based data collection terminal specifically designed to allow truck drivers to process their own scale transactions. Because the data collection terminal communicates real-time with a PC, the transaction data is available as quickly as the transaction is processed and posted to the local PC or network. This is especially useful when an interface is needed to a current Operations/Accounting Software Package (ex. Great Plains/Dynamics) that requires “orders” to be exported to the scale data collection system as they are entered. Because the RTSA is run directly from Interact®, it offers many configurable options. Some of these options include flexible driver prompting (i.e. Truck, Job, Material, etc. ), processing transactions with or without stored tare weights, and versatile ticket printing. In addition, options such as RFID technology, gate control and image capture can be incorporated to further enhance the system. The driver interface is an easy to use, telephone style numeric keypad with a bright four-line display. Driver directions are typically posted next to the RTSA in a locked weather-resistant, outdoor enclosure or on a wall when the unit is mounted inside a building.